There is some talk that lowering an NVIS or N.V.I.S. antenna very close to the ground enhances NVIS operation. The problem is very few people have actual measurements. They either use computer models (mostly NEC-2) or seat-of-the-pants feelings about what happens. I highly recommend reading Dean Straw's (N6BV) article in December 2005 QST on page 38. I've decided to post some actual measured data from a Viet Nam war study of NVIS antennas. The little circles that appear above or below the smooth curves are actual field strength measurements made in 1970 by Hagn and Barker in Thailand. Compare the circles to NEC-3 curves (the curved lines) for two different ground conductivities in the model. This was an attempt to match real-world measured data using accurate test equipment and helicopters to measure FS above a real dipole with a model on NEC at 5MHz. This data is over very good SE Asia rich black jungle soil, much better than found in most US locations. This means ground losses are lower than we would have in most locations. 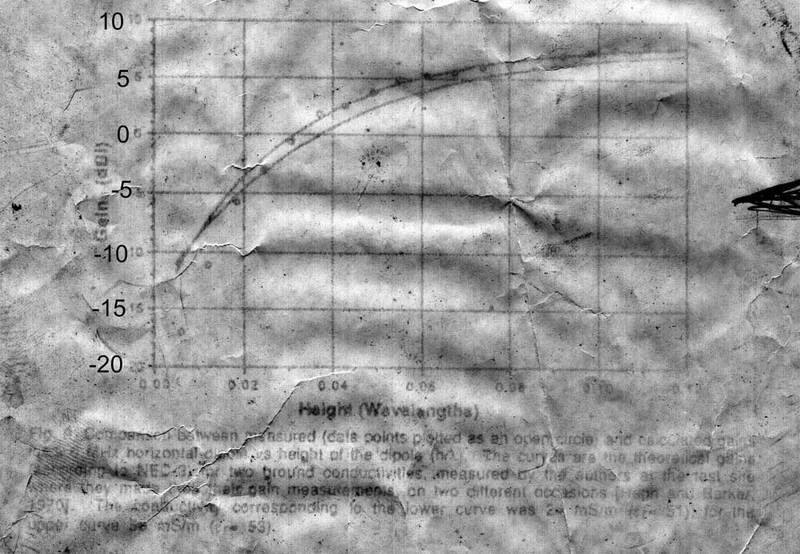 I'm sorry graph quality is so poor, but the paper is a very old thermal paper image. I'm happy any of the pages are still readable. Notice between .02 wavelength and .12 wavelengths the measured data (circles) matches the computer model closely. At about .02WL the conductivity in the model had to be decreased to match the actual data. Peak field strength was +8dBi at 24 feet (measured at 5MHz). At .005 wavelength (1 foot high 5MHz) the field strength was -17dBi, down 25dB from 0.12 wavelength height. At .02 wavelength (4 feet high at 5MHz) the field strength was -5dBi, down 13dB from 0.12 wavelength height. At .04 wavelength (8 feet high at 5MHz) the field strength was 3dBi, down 5dB from 0.12 wavelength height. At .06 wavelengths high (12 feet at 5MHz) field strength is down 3dB from 0.12 wavelength high. To convert these points to other frequencies multiply the height in wavelength by the wavelength in feet. Use F / 984 = wavelength in feet. For example 3.8MHz would be 984 divided by 3.8 = 259 feet. This means a .02 wave high antenna (13 dB of power loss) would be 259 times .02 = 5.2 feet high. We can reasonably expect, over very good soil, a 5.2 foot high antenna would be down 13dB from an antenna 31 feet high. This would be true at any distance. Compare this to +8dBi measured in Thailand. Very good agreement. Now let's move the antenna lower. Compare this to -5dBi for the real antenna and we see it is still very good agreement. This shows both the EZNEC+ model and a real measurement agree closely. EZNEC+ tells us we lost 11.6dB while the actual measurements tell us we lost 13dB. We now see EZNEC+ shows -11.4dBi which is -19.4dB from our 31 foot high antenna. The actual measurement from Thailand shows the signal was down 25dB from the higher dipole. In this case EZNEC+ is overestimating signal strength by about 6dB. Now here is something to consider. People claim distant signals get weaker and short skip signals get stronger when the antenna is lowered to very low heights. Factually that just isn't true. We have measurements made with sophisticated equipment using helicopters to fly over the antenna area and plot radiation. Those measurements prove we lose considerable signal level on transmitting as the antenna is lowered below .05 wavelength (about 12 feet). We have models that closely agree (except at very low heights). We also see the pattern hardly changes. If the pattern or directivity hardly changes, the signal-to-noise ratio on receive will not change either. The only difference will be a weaker signal and weaker noise, just like adding an attenuator. The problem is a low antenna kills your transmitting signal, turning a 100W rig into the equivalent of a 1 watt transmitter in the case of a very low antenna. I'm afraid I have to side with R. Dean Straw's QST article, Hagn-Barker's actual field strength measurements, EZNEC+, and my own experience measuring and using antennas for the past 40+ years. Please, let's not give silly advice like 5-foot high antennas are good ideas for emergency communications or NVIS operation. Very low antennas produce very low signal levels at any distance when compared to antennas of modest height. Some claim a screen, counterpoise, or reflector wire grid below a low dipole will not improve signal levels. My own direct experience shows the idea a screen will not improve signal levels is NOT true, and that a counterpoise system can actually improve signal levels. This is true even when the screen or counterpoise is not tuned. On 75-meters, back in the days of 3830 and 3895 radio wars, there was always a definite advantage to stations using low dipole with good screens or counterpoises below the antenna. this was a trick I first earned from W8PSX in Westlake Ohio , where Jim had a counterpoise system below his 160-meter dipole. One counterpoise wire below antenna. This antenna has almost 2 dB more signal level. This antenna, with three untuned ground counterpoise wires, has 3 dB more signal level. With many counterpoise wires, the model improves 3.7 dB. It's my belief the actual improvement I saw was around 5 dB in my own systems, although this varies greatly with antenna height and soil conductivity.